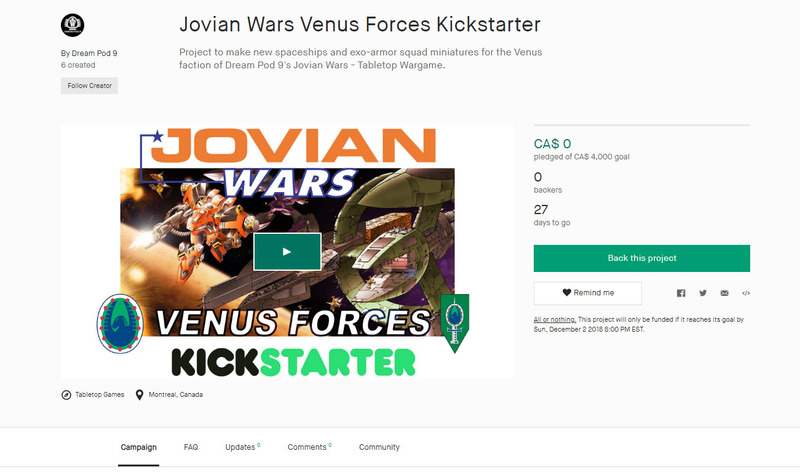 Dream Pod 9: Jovian Wars Venus Forces Kickstarter is now Live! Our initial funding goal is $4,000 CAD, needed to cover the mold costs for the high quality multi-part resin spaceships and give our Backers some great reward packages. If you love spaceship miniatures please checkout the 8 new spaceships (1/4000 scale) and 9 exo/fighter/bomber squads (1/1000 scale) 3d models at the following Kickstarter link. And help us by pledging for a Captain reward level $76 CAD pledge (about $59 USD), which includes a Jovian Wars Patch and 4 ships. Or maybe a Commodore reward level $138 CAD pledge (about $106 USD) with Patch and all 8 ships. Thank you all for your support. Home › Blogs › Robert Dubois's blog › Jovian Wars Venus Forces Kickstarter is now Live!